Are you interested by tarot cards meaning and tarot predictions? Find out how it works and what you can discover through this practice. You can also make predictions and get answers for your life. 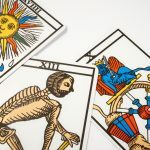 Tarot cards meaning: how to interpret them? To make the correct interpretation of the Tarot de Marseille it is necessary to study it and practice many times. By studying the meaning of each card and doing the interpretation, the tarot card reader will learn how to use their intuition to make accurate divinations. The Fool: carrying a bag symbolizes the affection that he carries and the stick demonstrates that it has spiritual aspirations. The Cat (or Dog) that scratches him indicates that this is the eternal pilgrim who will escape from a fatality. The Magician: he is a juggler, an illusionist, etc. Therefore, if he expresses movement and creativity positively, he can also put forward futility, speculation, even lies to achieve his ends. The Priestess: the tiara that the Priestess possesses symbolizes the three dominant planes: Vitality, Action and Mind. The Empress: the Empress’s hair represents, for the most part, the wisdom and experience of life. Her red dress symbolizes the vitality that the Empress preaches. The Emperor: the crown that you can see in the Emperor’s card symbolizes all that he represents, and he is above all influences. The Pope/The Hierophant: the Pope is about experience and all spiritual power. He wears a red and blue cape and this represents love, reflection and balance in all fields. The Lovers: the blond hair of the Lovers card symbolizes the purest gold, inaccessible to those who have some kind of contamination. The Chariot: looking at The chariot tarot card we can see a driver pulled by a car with two horses looking to the left and representing the material and spiritual bonnet. Justice: the sword that is drawn with the right hand and the scale that we observe are indicative of a figure that does not allow to be corrupted. The Hermit: the Hermit wears a blue tunic that symbolizes control of passion through reason. The Wheel of Fortune: three figures representing the animal nature. The descending one wants everything that is material. Strength: the hat she is wearing symbolizes the psychic powers and knowledge she possesses. The Hanged Man: the rope of the Hanged Man symbolizes access to the spirit world; his material and earthly desires are very strong. Death: the plants that are born and grow around this character mean the triumph of life and the rebirth – after the end of a phase – the beginning a total physical and mental transformation. Temperance: temperance is a protective angel who mixes the waters of her jugs and represents the help of the Divine in her peace and inner harmony. The Devil: according to tarot cards meaning, in matters of the heart, this card can mean an unfulfilled desire, a devastating passion or a violent and transient relationship. The Tower: the Tower symbolizes commotion. The characters that are falling represent the selfishness and pride that let them be affected by the situation they are in. The Star: the Star symbolizes all that is pure and is in harmony with nature. The Moon: The Moon card is related to intuition, the night, the shadows, mystery, and the feminine essence. This card means “False Illusions”. According to this, you should be careful with less positive energies and illusions that may arise. The Sun: The Sun card represents brilliance, glory and success. It is associated with the star of the solar system, source of light, heat and life on Earth. The Judgment: /the-judgement/ When this card comes out in a reading it indicates that our thoughts, words and deeds are being judged in the subtle spheres. The World: This card represents the deserved reward for all the efforts you have made, and indicates that you will reap good fruit from your work, dedication and commitment.